Chelsea face Hungarian side Vidi on the road in their final Europa League group stage game on Thursday night. 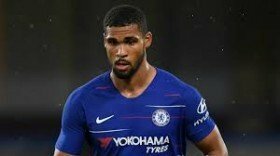 The game is pretty much meaningless for the Blues who have already qualified for the knockouts with the top spot and Maurizio Sarri is expected to feature a number of fringe players on Thursday night. Kepa Arrizabalaga has been constantly used for the league and European duties this term but he should earn a break on Thursday night with Willy Caballero earning a rare start. In the defence, an overhaul from the regular side is expected with Europa League constants Davide Zappacosta, Andreas Christensen, Gary Cahill and Emerson returning to the fray. Similarly, Cesc Fabregas and Ross Barkley are likely candidates to feature at the heart of the midfield and they could be accompanied by a young Ethan Ampadu whose returning after another knee injury setback. In the front line, Callum Hudson-Odoi should feature on the left wing after a man of the match against PAOK with a goal and an assist and he could be accompanied by Ruben Loftus-Cheek on the opposite flank. Upfront, Alvaro Morata could get another chance to lead the line after playing no part in the Blues' 2-0 Premier League triumph over Manchester City last weekend.